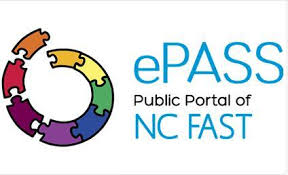 ePASS is a quick and easy way for individuals and families to learn about and apply for available benefits and services. Online applications are available for Food and Nutrition Services(formerly Food Stamps) as well as Medical Assistance(Medicaid and NC Health Choice or CHIP). You can learn if you are potentially eligible for Medical Assistance by completing an electronic pre-assessment screening. To learn more about ePASS please click here. If you would like to watch a video about ePASS click here.